We are now hiring at all locations, especially Panama City Beach for Spring and Summer season. Check this out…our Long Beach location is now hiring from $13.50-$14.00 with an opportunity for $1/hr bonus for overnight shifts!! You can make $15 an hour! Come join our team and take advantage of some other great benefits like paid time off, free meals, and access to free education!! If you want to be close to the beach, maximize your pay, and work in a fun, fast-paced restaurant, then check out the opportunities at our beach locations. From Navarre to Panama City Beach to Port St. Joe, we have opportunities to make the most of your summer! Panama City Beach restaurants offer starting pay for team members up to $11.50, Navarre up to $10, and Port St. Joe at $10/hr. Great pay, amazing benefits, work with friends and amazing teams…what more could you ask for? Apply today! In our 24-hour locations, we offer an overnight bonus of $1.00/hr for those that work full time on the overnight shift. We offer bonus pay at a reduced level for part-time overnight workers. In addition, we have great benefits and opportunities for growth and advancement. Starting pay for team members and management vary by location. Click on the team member and management tab above to find out more. Click on any restaurant on the right and apply for a position. Come be a part of one of our great teams! We continue to modernize our restaurants to make them the most beautiful McDonald’s you have ever seen! Recent major remodels have occurred at our Port St Joe and Long Beach locations. Both locations are hiring for all shifts and positions, both team member and management. Click on the desired location on the right and apply for a position. Come be a part of this great team in a restaurant like no other! Don’t miss out on this opportunity! Apply today! We are currently hiring at each location for a variety of shifts. McDonald's is the largest food company in the world and we pride ourselves on outstanding relations with our people. We look forward to working with you in the future and growing together. Thank you for your interest! Please apply online and take the "Hiring to Win Assessment." You may do this at most of our restaurants at the Hiring Kiosk or on one of the apple computers. There are flyers located in each store with more information. At David Costa Enterprises we value you, your contributions, and your growth. "To be the world's premier quick service restaurant, creating an experience beyond expectations for each and every customer through happy smiles, personalized quick service and quality, hot, fresh food." A career at McDonald’s can take you places that you never imagined. 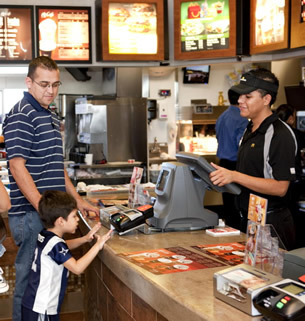 Did you know that over half of current McDonald’s managers started out as crew members? Over 30% of McDonald’s owner/operators also started as crew members. Your advancement only depends on your desire to succeed. You can go as high as you want! We will train you from the very basics to advanced restaurant management skills. Our state of the art training programs range from computerized learning on restaurant stations to world class facilities at Hamburger University (HU) at McDonald’s Headquarters in Oakbrook, Illinois. Did you know that you can achieve college credits for McDonald’s management courses, and that McDonald’s supports higher education opportunities for employees including providing college scholarships and tuition reimbursement? David Costa Enterprises is a rapidly expanding company that believes in this principle whole-heartedly. We are currently searching for hardworking, dedicated, and enthusiastic individuals to work with our team of managers. Choose from the list of our restaurants on the right side of this page and follow the links to apply for a management position. Advancement options – we love to promote from within! 5-week sabbatical after 5 years. Now Accepting Applications for Hospitality Ambassadors at all locations. We are seeking friendly, energetic people that love interacting with children and adults. This position will be separate from the crew position and will be mostly focused on providing “an experience beyond expectations” for our guests that visit our lobby. Some sample tasks might include: Welcoming guests, helping with high chairs and trays, Sampling new products, passing out stickers, hats, and small toys to children, refilling drinks, cleaning tables off, and more! You may also fill out an application. We will need an application for the interview. Just chose a store to the right. In addition to these duties, we are looking for someone with facilities maintenance experience that can handle tile repairs, painting, pressure washing, basic construction, small kitchen equipment repair, plumbing, refrigeration repair, and other preventative maintenance tasks between our Panama City and Panama City Beach restaurants. Please choose any of our Panama City or Panama City Beach restaurants and apply for the Maintenance Technician position.